Shhh....you hear that?... Me neither. Do you smell that bacon frying? I don't. Feel that clown tickling your feet? No sir. Glad I don't. Well then welcome to the vacuum. I SAID, "WELCOME TO THE VACUUM!!" (Get it? Cause you can't hear in a vacuum? Shouldn't be able to read either...this post has more plot holes than swiss cheese. But I continue). Even me with all the voices in my head at any given moment is starting to feel the effects of the dreaded intel void. Le black hole. Do the words "sensory deprivation" tip the scales to the negative side? I mean anytime you're "deprived" of something that kind of sounds not so good. Food deprivation. Healthcare deprivation. Education deprivation. Sleep deprivation. Hookers and... okay I'm not gonna go there. Kinda sorry I open the door. Where was I? Ah yes… oxygen deprivation. Muscle deprivation. Etc etc. And it always follows good things right? Never bad things. I've never heard of prison deprivation. Herpes deprivation. Or hangover deprivation. Are you feeling rat deprived? Just call 1-get-mor-erat. Feel a psyop coming on? So sensory deprivation gets lumped in with all these bad guys. Why is that? Another cheesy psyop? (Kinda all cheesy at this point yes?). Everything else in this illusion filled world was so why not? Heaven forbid you can't see like the blind man. Heaven forbid you can't hear like the deaf woman. Heaven forbid you can't taste a crème brûlée. Or can't touch the newborn babys skin. Being taught to be deprived of ANY senses is a conditioning that we are somehow less than whole. All the while they can afford silicon valley blood transfusions and Guatemalan organ transplants. Fracking psyops. I was skimming some articles and found this title: I Survived My Terrifying Hour in a Sensory-Deprivation Tank. Scary right? Like Freddie Kruger was in there with her. 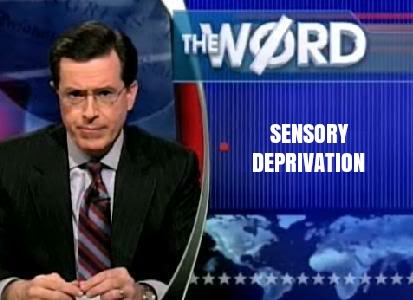 So why this negative connotation for sensory deprivation? Is it because "they" never wanted us to be alone with our thoughts? Alone with our God selves? Without any of their Kardashian stimuli? Or "Baby baby baby" Belieber? Is it because in those quiet moments we somehow are closer to God? Is that what gets in the way of us buying their NFL package? Or the new Halo? There's always something going on isn't there? NFL draft. NBA draft. MLB season overlapping with the NBA tournaments. MLB world series overlapping with NFL? Its a vicious circle. And on and on it goes..where it stops nobody knows. World Cup soccer qualification. Tennis, golf, rugby, cricket. And if sports ain't your bag, there's always Law and Order 24/7. May you live forever detective Lenny Briscoe. Notice how every restaurant has a million tvs now? Is it to subdue us? To keep us "orderly"? Well it works cause everytime I go out, everyone's a zombie. Hardly talk at the table let alone meet new people. Do not make trouble. Do not rock the boat. Do not share ideas. Do not grow. Stay sensory overloaded till you're exausted and at home. Sit Ubu, sit. Good dog. Now roll over. We all stepped away from this room at one time or another for various reasons. But we always seemed to come back didn't we? Can't pass up the stimuli. So there you go…we bought in to the must-have intel stimuli psyop. Yes me....yes you. Because heaven forbid our precious just maybe the stimuli that's keeping us from moving a little closer to ourselves and/or God. After all the lessons, maybe now is not a bad time to shut the entire world out and go on a date with yourself (oh behave). Get to know the real you before it all gets nuts. See what the real you is been dying to show you, but just couldn't speak over Bob Costas. Over all the intel calls. Couldn't compete with that new Wonder Woman movie. 92% Rotten Tomatoes. Guilty, your honor. So here we stand deprived of any solid Intel for around five daysish. And by now we use the term "solid Intel" loosely. No offense to any gurus but we haven't crossed the finish line yet. But now even they've left the room. And why? Is it a test? Is there room full of lab coats with clipboards behind a two-way mirror seeing how we're going to react? Like a drill sergeant who leaves his troops in time of battle to see who's gonna step up, freak out, wig out, check out, take command, take a snooze, take a duece or take off? I'll bite. I'll bite cause I think we're handling the Intel deprivation spectacularly. Sure a club or two still want a sucker at mama bears teat, but for the most part, the grads are cuising. Starting to act like we've been here before. *sniff* I'm not crying...my eyes are just a little sweaty today. To go from intel sensory overload to intel sensory deprivation is a little intense. Even for us vets. Even for the battle tested chosen ones. Kinda like going to intel rehab. Kinda like Charlie Sheen's tiger blood. Tonight's Word: COLD TURKEY. Much love Miguel, CPA. E-J, sorry to hear about your loan shark troubles. But help me with this, is Nicoli Russian for "knuckes" or "kneecaps"? Or is it dealers choice? Either way, stay out of Little Russia for a while. For Derrazo, One Who Teaches, Harmony, Shaken, Sharon and all you wild and crazy ones riding into town crying "The RV is coming..the RV is coming!!" Good on ya, lasses and lads. That I just can't live down.